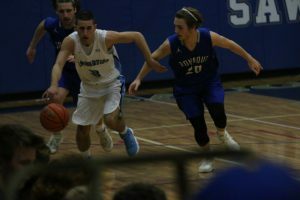 The Saugerties Sawyers Varsity basketball team is having a great season in 2018. Led by senior Austin “Cur Dog” Curlin and 8th grader Dior Johnson, they are lighting up defenses and scoreboards around the Mid Hudson Athletic League. Most teams are focusing on stopping Johnson but are being handled by Curlin! Austin Curlin is a basketball player who eats, sleeps, and drinks the game. “Ever since I was young I’ve had a ball in my hands. As I grew older my love for the game grew. Basketball was and still is my special place. Nothing or nobody can bother me when I am playing basketball,” said Curlin. 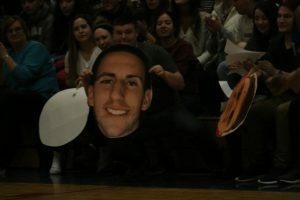 Curlin is presently averaging 12 points and 7 assists per game. He has represented Sawyer Basketball in an honorable manner in t he three years he has played. “I am extremely honored and proud to put on a Saugerties Sawyers jersey because of all the great athletes before me. Hearing stories about when both Coach Tiano and Mr. Fabiano played is awesome. Then being able to watch Darnell Edge and Paton Gibbs play was amazing. I was lucky to get to play with Shawn Jansen as well. There are numbers of outstanding athletes who came out of this great town,” said Austin. He is very athletic and is also a soccer star. He is considering trying out for the baseball team in the spring. Curlin last played baseball in the 7th grade. However, basketball remains his favorite sport. Since his earliest memories Austin has loved playing the game. “I love how five guys have to work as one to win. I love playing up tempo and setting my teammates up to score. A true blood athlete Austin is the son of Kingston sports great Dennis Curlin. Austin’s Mom is Kathy Cavanaugh, the daughter of Saugerties legendary Biddy League and CYO coach, Charlie Cavanaugh.